By knowing the meanings of various trade show terms, you can make better decisions and save some money when planning your next show. Every industry has a unique lexicon with terms that may have totally different meanings outside of the context of that industry. When outsiders hear you talking about your industry, they may even feel like you’re speaking a totally different language! 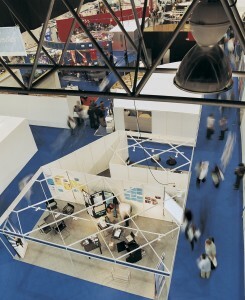 The expo world also has its own unique set of jargon that is difficult to understand at first glance. However, taking the time to learn the language pays off – it will enhance your expo experience, help you stay within your show budget, get your booth and promotional materials to the show location on time, and deliver a higher quality product to your audience. While there are many trade show terms you should know, there are five in particular that are very important and should be the cornerstone of your knowledge. While you might think the decorator at your trade show is the one in charge of decorating the space and making it look nice, the actual job is much more detailed and nuanced in the context of the expo world! A decorator provides much of the site logistics required to make a show work, including on-the-floor unloading, fork lifting, electrical needs, and plumbing. They also provide all of the necessary labor, equipment, and any insurance used at the show site. Think of the decorator as the company in charge of the show as a whole. When you ship your booth and promotional materials to the show location, there are two options you can take. You can ship directly to the show location, which allows you to have the most time available to plan out your display but puts you at risk of having your cargo arrive early or late. The other method is shipping to an advanced warehouse and storing your materials there. The warehousing for this service is called drayage, and it does come at a cost. The industry standard is to provide 30 days of storage at 10% of the quoted materials handling fee, but this may differ depending on location. Drayage is a necessary evil when planning to exhibit at a show, but there are ways to minimize the costs associated with it. Many confuse drayage with material handling, but these are two separate terms that refer to different processes. Material handling refers to the equipment, labor, and processes used to move your exhibit and materials from the dock to the show floor and back again at the end of the show. CWT is a unit that is used for pricing purposes in the expo and logistics industries. It means “per one hundred pounds” and, for a show, will most often be the price point used for material handling. This price can vary within a given show depending on what time of the day and which day of the week you have your materials moved in and out of the show. The cost is usually a one-time fee paid upfront to the show organizers. You can determine how much your fee will be by referring to the material handling section of your show kit. Think of marshalling as the step between your booth and promotional materials leaving your warehouse and arriving at the show floor. Every show has a marshalling yard that hosts all of the semis of equipment for all of the show displays. The drivers head to the marshalling yard and register with the show Decorator – providing paperwork that indicates the client, show, and booth number they are delivering to or picking up. This is an integral process that helps shows run smoothly. Armed with this information, you can make your next trade show a success! Contact AFP Expo Logistics for transportation solutions tailored to your unique needs! This entry was posted on Friday, April 13th, 2018	at 9:55 am	and is filed under AFP Expo, Trade Shows	. You can follow any responses to this entry through the RSS 2.0	feed. Both comments and pings are currently closed.